The photoshoot for these beauties was somewhat moody. I’m usually a light and airy kind of girl, but combining the light and airy meringues with an overly bright scene seemed too much. So I played around with shadows. 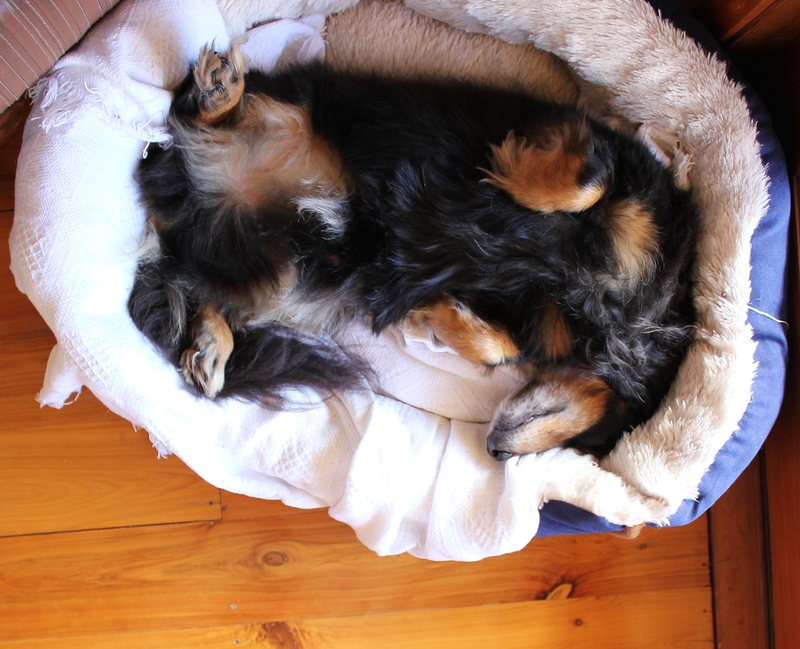 Even Norman was more sombre than usual…which is ridiculous, because he’s the world’s most laid-back dog. 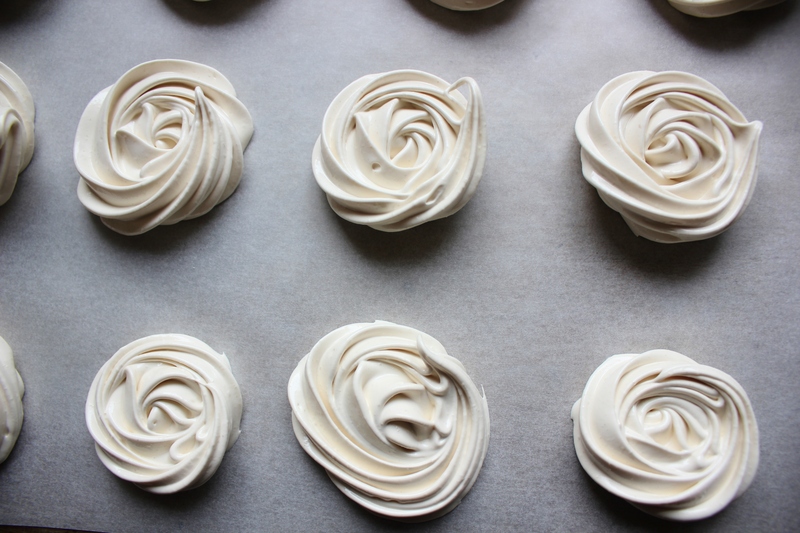 But these meringue rosettes (and a few little pieces of good news) brightened my day. 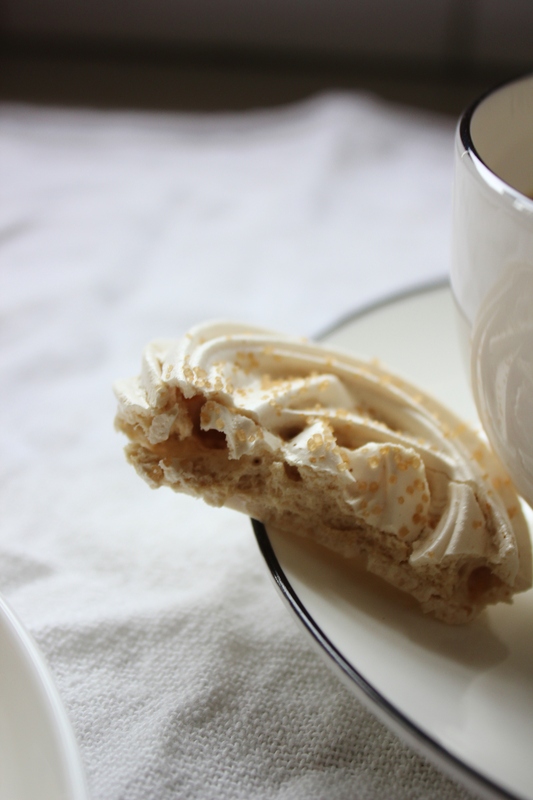 The chai in the meringue lends them a spicy undertone that is a nice change for meringues, which are usually saccharine. Try these dainty little treats, they’re gloriously sunshiny. When I made chocolate swirl meringues, I suggested that people wipe down the whisk attachment and bowl of their mixture with half a lemon to remove residual fats. I always do this because fats can flatten meringues. Whip your sugar and egg whites together. Start on a lower speed (I went for 3 on my stand mixer) and speed it up a notch at a time (up to about 8) over the course of a minute; I find that this method gets the most air into the meringues. While the egg whites whip up, preheat your oven to 120°C and line two baking trays with baking paper. Add your chai powder after about 5 minutes. Keep whipping until the mixture is thick and glossy. It should take a further 3-5 minutes after adding the chai. When you’re done, the your mixture to hold soft peaks. Spoon the mixture into a piping bag fitted with a large star shaped nozzle. Starting at the centre of the rose, pipe two full spirals to recreate the rose look. Sprinkle the uncooked meringues lightly with cinnamon sugar. If you don’t have any cinnamon sugar lying around, make your own by combining two tsp of granulated sugar with ¼ tsp of cinnamon. Pop them onto your lined baking trays and bake for 40-45 minutes – you’ll know they’re done when they’re dry to touch. I erred closer to 40 minutes and the inside was still soft and chewy – if you don’t want this, leave them in for longer. Transfer to a cooling rack and devour once cool. Pretty! 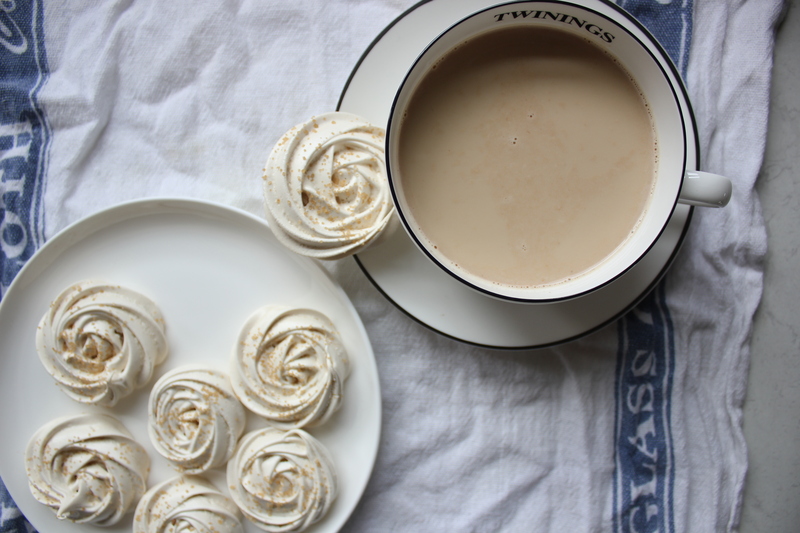 Moody meringues and a cuppa is just the thing for a lazy Sunday afternoon. I like the teacup and saucer too! Oh thank you 🙂 Meringues and Sunday afternoons go hand in hand, don’t they? My tea cup is from the Twinings shop in London… I’m such a tea addict! Haha thank you! Norman is definitely not camera shy, is he?! The star tip make the meringues such a nice shape 🙂 Do let me know if you try them. I sure will! I even have a star tip so I shall have to experiment. I love the rosette it’s so elegant and beautiful! They look absolutely gorgeous! I’ve still never (succesfully) made meringues, but I’m definitely going to give it a good try soon. Thanks Anne 🙂 I never had the patience for meringues, but ever since I got Penelope (my stand mixer), they’re so easy! Once you get the hang of them, you’ll want to make them all the time! Haha thanks 🙂 normal electric beaters are good too, you just have to be patient. Lots of practice and spare egg whites help too! I’ll give it a go soon! Patience is always a bit of an issue with me, haha! Your photo is beautiful, perfect!! 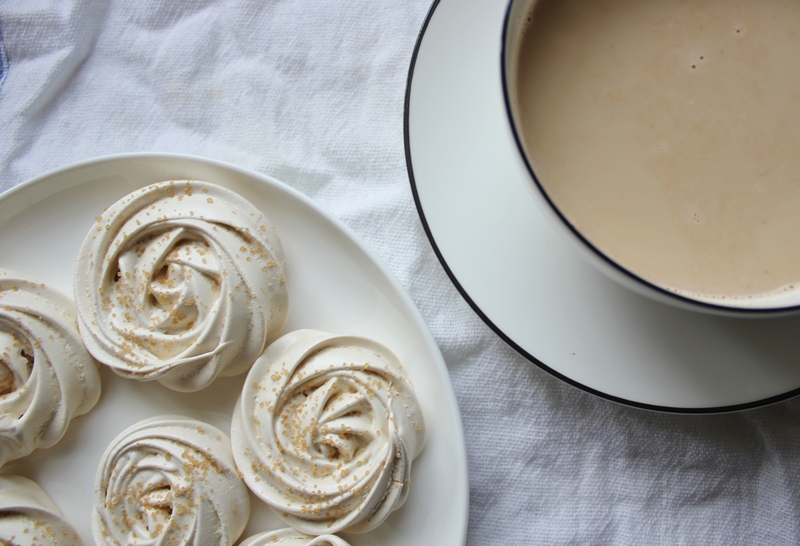 Love your meringues, really lovely flavoring with chai. Your roses are perfect! another great “job” Gab! Thank you 🙂 I thought so too! They were almost too pretty to eat… almost!